← Home Opener, Yard Work, etc. It’s been a while since the last time I sat down to type out a blog entry, hasn’t it? Over a month, to be exact. Fortunately for you, I don’t feel compelled to write down any daily drivel that pops into my head in this BLOG, like some others do with their blogs. Its been a busy month, but I haven’t felt compelled to make daily – or even weekly – entries. My business trips continue… they seem to occur monthly or so. The last one was to help run a conference down in Washington DC. During the conference I was able to scoot up to Baltimore Wednesday night and catch a baseball game at Camden Yards. The Red Sox were playing the Orioles on a 3-game road trip. Tickets at Camden Yards are easier to get than tickets at Fenway Park. I was able to walk right up and buy a ticket. The ride up from DC was long – traffic in the DC-Baltimore area at rush hour is always horrendous. It took two hours to travel the 47 miles from McLean VA to the park. We (a colleague and I) arrived in the middle of the first inning. Camden Yards is a very nice park; good seats, good view, and great hot dogs! Next month, when I’m back in DC for another conference, a bunch of us will be attending a Washington Nationals vs. Colorado Rockies game at RFK Stadium. That should be fun, too! We had another Storm Of The Century last weekend – widespread flooding all over New England caused by 9 – 16 inches of rain. Boston got 9 inches of rain, our town got 11, the north shore (Peabody, Newburyport, etc.) got 16. That’s a lot of water! All the area rivers were 3-8 feet above flood stage, causing extensive damage in low-lying areas. Dozens of families had to be evacuated. We’re not near any rivers or large bodies of water (just a drainage brook on the edge of the back yard), so we weren’t threatened by flood waters. Our problem is excess runoff and ground water that can’t be absorbed quick enough. We had a similar Storm Of The Century ten years ago, in October 1996 (centuries seem a lot shorter these days! ), and because our split-level house (with a finished lower level) has a back door that is below grade, we had water coming in the door ten years ago, causing a fair amount of damage in spite of my attempts to keep it out (bailing and pumping 48 hours straight). So after that, I dug down 4 feet in a 4×6 area by the door, put in a sump barrel and crushed stone, and installed a submersible pump in the barrel to pump the excess ground water away from the door. This time it worked. At the peak of the storm the pump was cycling every 15-20 seconds or so, but it kept the water out. I owe that pump a beer! My spare genealogy time lately has been taken up by a big – and tedious – job. I’m switching genealogy programs. My previous program, Generations, which I have used for years, is no longer supported and is a dead program. No more support, no more updates, no nothing. With time marching on and new versions of Microsoft Windows on the horizon, it’s only a matter of time before my ability to run the program on future computers comes into question. So, I bit the bullet and switched to a new program, The Master Genealogist, or TMG. The program itself isn’t new – it’s been around for years – but it’s new to me. One of the biggest problems with doing something like this is that each genealogy program is unique and the data formats are not compatible. There is a data interchange schema (GEDCOM), but it’s a lowest common denominator and does not translate perfectly to-and-from all the genealogy programs that use it. One of the big attractions of TMG was that it had a native Generations transfer capability – at least that’s how it was advertised. Turns out that transfer capability is not perfect either, so I bit the bullet and am going through the database record-by-record and comparing it to the old program to see if anything’s missing and if notes or chunks of data can be better expressed using features of TMG that don’t exist in Generations. I have over 5500 people in my database, and each person has 1-20 or more data items that have to be checked. Add to that the images that didn’t transfer well, and the reference sources that got scrambled a bit, and it translates into a big and time-consuming job. So when I have a spare few minutes, I pull up both programs and compare a record or two or ten, making changes where necessary. I’ve been working on this for over a year now, off and on. My guess is that I have another year or so of work at the current rate of progress. There is a hidden benefit to all this work, though. It’s making me examine ALL my factoids and data items, and I’m finding a number of small (and not so small) errors that were in the original data. Re-examining assumptions made ten years or more ago can be enlightening! It’s also amazing how many times in the early tears of my research that I neglected to document where a date or fact was found! I was bad! Genealogists – ALWAYS document your sources!!! With the rain and other distractions, we haven’t installed the landing lights out front yet this year. It’s scheduled for Memorial Day Weekend. 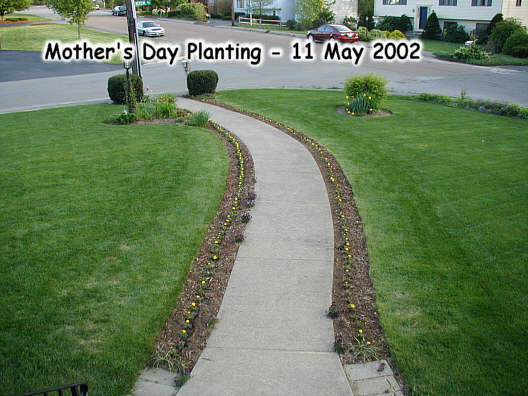 Every year for Mother’s Day (or as close as we can get), the girls plant 400 or so little marigold plants along both sides of the front walk for the entire length of the walk. With a single blossom on each plant at first, the front walk starts out looking like it’s lined with little yellow lights rather than flowers – they look like landing lights alongside a runway. But as the spring and summer progresses they fill out and become quite impressive eventually. 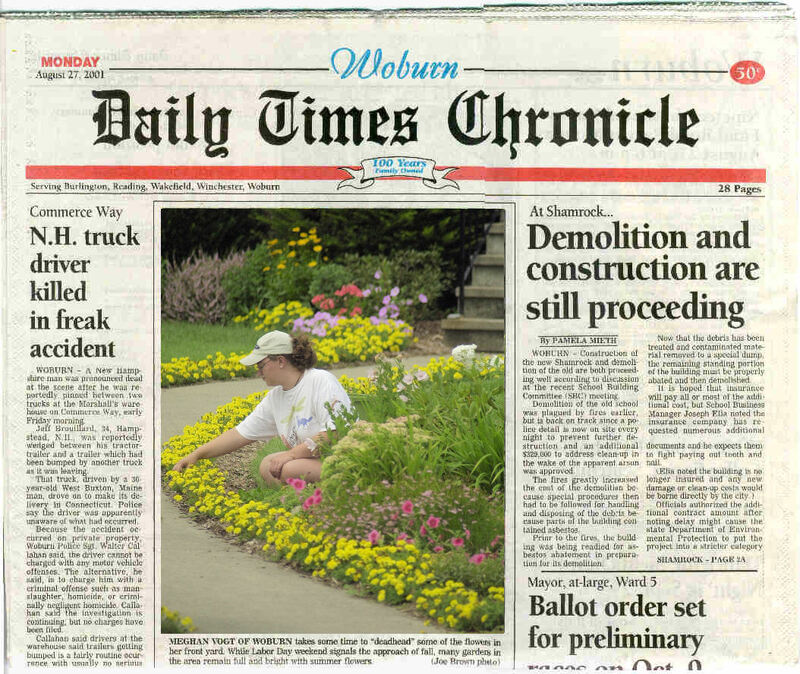 We even made the front page of the local paper with our marigolds one year!